“Thank you” shake for blind Pinoys. 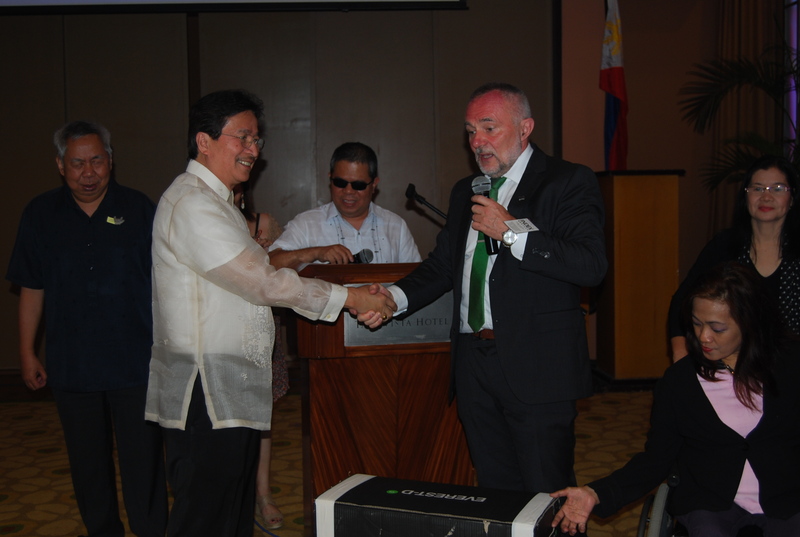 Deaf Blind Support Philippines (DBSP) President Edgardo ‘’Bong” Garcia (in barong) thanks Mr. Bjorn Lofstedt, of the Sweden-based ‘’Index Braille’’, on behalf of would-be blind Pinoy users of the embossers. NCDA Acting Executive Carmen Reyes-Zubiaga (front right), inspects the top-of- the- line items for 2 NGOs – CALL Foundation for the Blind and DBSP. Others in photo are CALL Foundation President Lauro Purcil (leftmost), Emcee Batangas Provincial Governor’s Advocate Ronnel del Rio and TCD-NCDA Chief Nelia de Jesus, (rightmost).